When your turn begins, you may add 1 rezzed card to HQ and gain credits equal to its rez cost. At a standard use this is not an economy card: Gaining back the money you previously paid while returning a rezzed card you had installed has a name: lose a click! Blue Sun + Oversight AI or BER + Wotan, Janus or Curtain Wall = Money But in such a case you have to head for a plan. what am I going to do with that money? Re-install and re-rez the ice to remove the condition? This is good but this is click costing: 1 to install ice, 1 to play OAI/BER, 1 re-rez ice. That makes 3 clicks? Plus 1 or 3 credits (OAI/BER). Isn't Eliza's Toybox better? Blue Sun + Eliza's Toybox + Wotan, Janus or Curtain Wall = Money Twice more than a Melange mining corp turn. But it costs an extra click to rez the ice. Blue Sun + Amazon Industrial Zone = Money. At -1 CE for the extra install, this basically makes 2 credits a turn. Hello Eve! Need money to score an agenda? OK. Your turn begins. You've just been siphoned to 0 credits. You have a 4/2 agenda with 1 advancement token installed. It is protected by an un-rezzed ice that costs 4. Looks bad. Now you can return a 3+ cost rezzed card to your hand and score. Looks better. To play this ID at full capacity (each turn), you have to consider you're playing with 2 clicks a turn instead of 3. Return cards to HQ to bulk it up in order to protect agenda from access. Against Nasir, return your rezzed pop-up windows to gain 0. re-install it outermost. Ridiculous and awesome. Against Kit, return a code gate to re-install it outermost. Remove 1 bad pub a turn (for a click) with Elizabeth Mills. Return your draco to reboot it as a 20-strength ice once you got damn rich ! Return asset/agenda/upgrade to install them on another server. Great with Simone or Off the Grid. Recycle your dead ices: You have a rezzed enigma. Your opponent runs Yog.0 that you can't destroy. Why not gain 3 anyway? Make Inazuma mobile, ready to empower whatever you installed. But to me, Blue Sun is optimized in constantly rebooting drip economy assets. It allows to reboot counters on install cards. It is awesome with Eve Campaign: When Eve has 2 credits left and your turn begins, instead of gaining 2 and trashing Eve, return it to HQ and gain 5. Use these 5 to re-install Eve and enjoy 7 more turns of money. 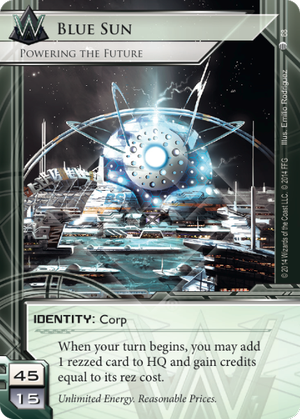 Looking at the card from the perspective of someone who is quite new to A:NR, Blue Sun: Powering the Future gives the Corp player a lot of control in how to accelerate their economy without compromising their Ice layer. A first turn Hedge Fund into an installed Tollbooth over R&D is a perfect example of a credit sink, and provided you have powerful, unrezzed Ice over R&D, you are effectively immune to Account Siphon and Vamp, even if they break your Ice. The ability to protect your centrals (Or even remotes) with powerful Ice, without actually having to make bigger overtures towards recovering your economy, cannot be understated in my eyes. The impression I get is that rezzing an Assassin in front of someone early is likely going to discourage early runs, or at the very least, heavily tax the runner on Traces. I think the top review covers the majority of things you can do with Blue Sun: Powering the Future, but I wanted to add the fact you're able to better balance your Ice defences with maintaining a steady economy, which can potentially hamstring a Runner by placing very obnoxious effects in front of them earlier than they are realistically prepared for. I really think Blue Sun is overpowered. I hate playing against it. The money a player can make playing blue sun is ridiculous. Oversight plus curtain wall a couple times early game before the runner is set up gives a cool 13 credits. There is some risk but not a lot. The big one is breaker bay grid plus adonis campaign. The corp can gain 7 credits in one click every turn. True they need to protect a server but if they get this out early they can afford to protect all their servers with taxing ice. There are other ways too. And once they got the money it's pretty much game over. They will either let you get an agenda and double counterstrike you, or go for a crisium and off the grid win. Then too as noted above, this id makes parasites, caissas, and femmes all but useless. This id makes grail ice quite hard to deal with. And I'm sure their are other great strategies with it that I'm not thinking of at the moment. All this from one sentence on the id. EDIT: So it's been quite awhile since I wrote this review. My understanding of the game has increased, and of course, there are tons of new cards. But I have to say, my opinion is largely unchanged. Now, up to recently, would I rather have played against Blue Sun than NEH? Certainly. But this was not because of the ID itself. Besides the extra influence, NEH is a perfectly reasonable ID. It was NBN's vast arsenal of extremely powerful cards that made playing against it quite challenging. Thankfully there has finally been a nerf to some of these cards (Astro, Breaking News, San San), making it easier, fairer really to play versus NBN. When considering just the ID though, there are none as powerful as Blue Sun. Granted there are cards that are effective against it. e3 Quetzal is probably the best deck versus Blue Sun. Employee Strike can potentially throw a monkey wrench in your plans if played at the right time. And if they can afford it (and that's a big if) Ankusa can ruin your day. In general though, you won't run into these situations too often. And the almost total immunity Blue Sun has to other popular runner cards more than makes up for this weakness. Money is king in this game. Blue Sun easily makes money throughout the game. The big thing though is the sudden, click-free intake of 14 or 15 credits that makes it so dangerous. Perhaps both players have 15 credits. The runner runs at an agenda. Corp rezzes Curtain Wall (down to 1 credit). One of the best breakers the runner could have is Cerberus, so we will say that they already have one installed. 7 credits and 2 counters gone (down to 8 credits). They steal the agenda and click for a credit (9 credits). The runner should be safe. The corp has no money, that's the price you pay for rezzing big ICE. That's how the game works. Blue Sun though starts its turn with 15 credits and after Mid, Scorch, Scorch, it is game over. This is just one scenario and there are obviously many factors like Link that come into play, but you get the point. The other thing is that every card with a rez cost but even some operations like Oversight AI, have a potential to be abused by Blue Sun. In my mind, the game creators need to take into consideration Blue Sun's ability with every single corp card they design. I've read about a Oversight AI, Curtain Wall, Clone Sufferage Movement combo. It probably wasn't thought of before CSM's creation. Now it does seem most people don't agree with me on this card. You do have to grant though, that it is a powerful ability. Don't IDs with particularly powerful abilities generally have less influence to play with? Iain, Kit, Harmony Medtech (not you GRNDL, you got truly jipped). Just saying.